Does your iPhone slow down occasionally? Yes, iPhones are well known for the fast processors and incredible performance; however, they are gadgets and prone to performance challenges like any other. It is frustrating, especially when you need to pull out important information or make an urgent call only to find your iPhone dragging. A slow phone disturbs the mind; you become unsettled and restless because a process is not going through. If you own the latest Apple gadget that runs on iOS 12, lagging is the last thing you expect. But if it happens, you may want to know “why my iPhone is so laggy?” Here are few tips of how to quickly handle the iOS 12 laggy issue. If you are looking for updating to the latest version of iOS 12, you should prepare some space for it. The iOS 12 size is more than 2 GB, so you may need double space for updating successfully. A regular cleanup only frees up some space, let the professional tool in and help you perform a deep clean by wiping unnecessary or even deleted files on you device. This is where the iMyFone Umate Pro for Windows or iMyFone Umate Pro for Mac can help. 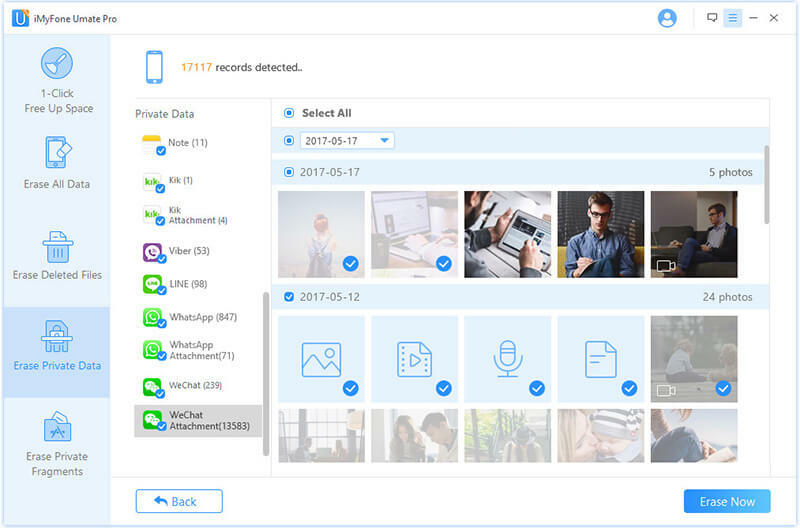 The tool cleans up junks and corrupted files on your phone, the tool can also manage your apps, photos delete large files and delete temporary files optimizing your iPhone for efficient and better workability. It can even help you keep your third-party apps safe from privacy leak. 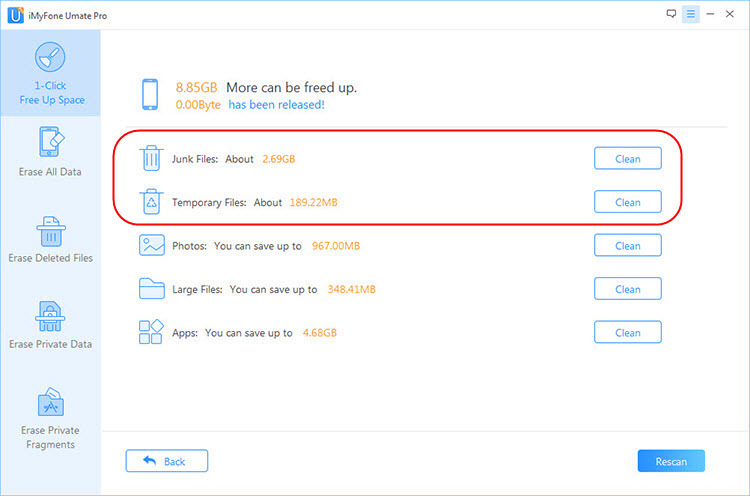 You may need more than 2GB space for the iOS 12 size. So you can get help from the iMyFone Umate Pro iPhone cleanser that is a tool used for freeing up space on your iPhone; it completely deletes data left behind after deleting some files on your phone, cleaning up and both protecting your privacy on your iPhone. Even if you don’t need to update to the newest version of iOS 12, it is necessary to clean up for maintaining a good statues for your devices. Step 1:	Download and install the software on your PC, run it and connect your iPhone via a cable. 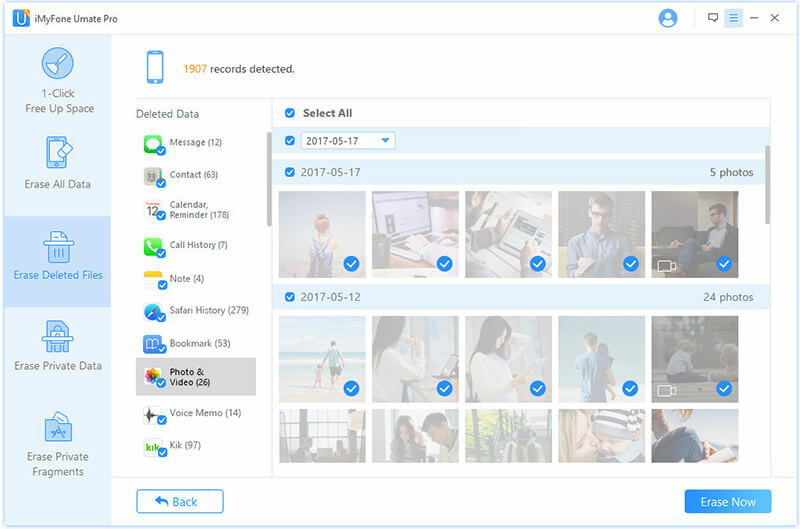 Step 2: Click on the “Quick Scan” to get a full space-saving analysis on how much space can be saved by cleaning up junk files, clearing temporary files, compressing photos and deleting large files. Step 3: Once scanning has been completed and shown the huge space you will be saved by cleaning up the junks and deleting those large files, you can now click the “Clean” button to clean up space. Step 1:	First, connect your iPhone to the PC. Step 2: Locate and click the Erase Private Data tab, followed by clicking on the “Scan” button. Step 3: It will then list all your private data including your photos, messages, call history etc. Once you’ve selected private files which you want to be erased, click the “Erase Now” button. Step 4: At this stage you will need to type “delete” into the box to confirm, and click on “Erase Now” button to erase the private data. Step 1: Connect iPhone to PC. Step 2: Select the “Erase Deleted Files tab, next thing to do is to click on the “Scan” button, once that is followed iMyFone will start to scan the device and list all of the deleted files. Step 3: Click on the “Erase Now” button to erase the files you’ve selected. Step 4: The next thing to do is to type in “delete” into the box to confirm. The delete process will then start after you’ve clicked on the “Erase Now” button. All methods explained in this article are great for managing space on your device. With this done, you are now ready to upgrade your device to iOS 12 without any trouble.